For the fourth year, REI, one of the High Line’s longest partners, will close all 153 of its co-op locations on Black Friday. Instead of participating in the largest shopping day of the year, REI encourages everyone to #OptOutside by spending the day outdoors with family and friends. REI believes that we spend our best moments outside together. That is why REI’s co-op pays their 12,000 employees on Black Friday to spend time outdoors with loved ones. Last year, over one million people chose to #OptOutside. We are excited to #OptOutside with REI again this year and hope you will too by joining us on the High Line. Open from 7am to 10pm daily through the holiday weekend, the High Line has 20 blocks of public green space for you to explore. Explore the relationship between indigenous people and museums with Duane Linklater’s pêyakotênaw, a series of towering tripods that resemble the structure of teepees between 28th St. and 30th St. pêyakotênaw is part of High Line Art’s Agora group show. 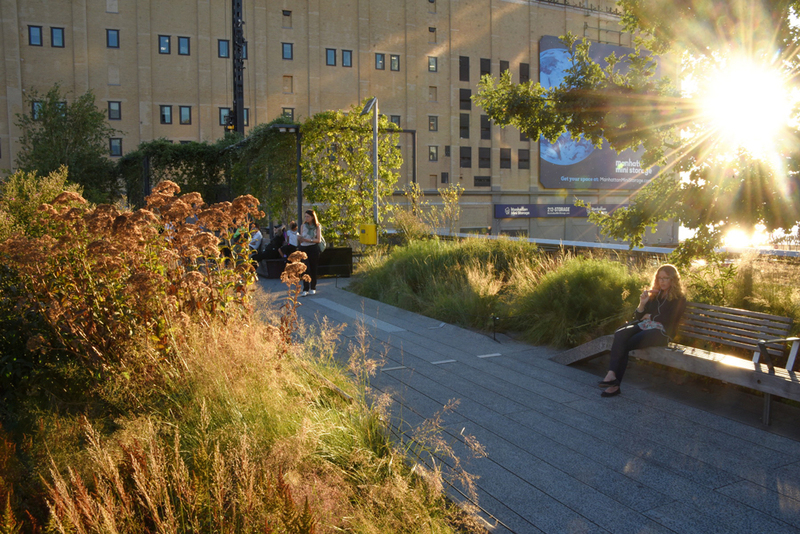 Take a stroll through our autumnal gardens at the Eastern Rail Yards, Crossroads, & Pershing Square Beams along 30th St. As you walk out of the path of tall buildings and into this open space, you’ll get a breath of fresh air, leading to spectacular views of the Hudson River. Download our app to impress those out-of-town visitors. We’ll provide all the info you need on our art, plants, history, and more—it’ll make mom proud. Unable to visit us this Friday? You can still #OptOutside and take advantage our free High Line Winter Tour, every Saturday from 12 to 12:45pm. This tour offers the chance for visitors to learn about New York City’s park in the sky’s history, design and landscape.